From many places in Penzance, you can see St Michael’s Mount reaching majestically toward the sky, its flag flying proudly. 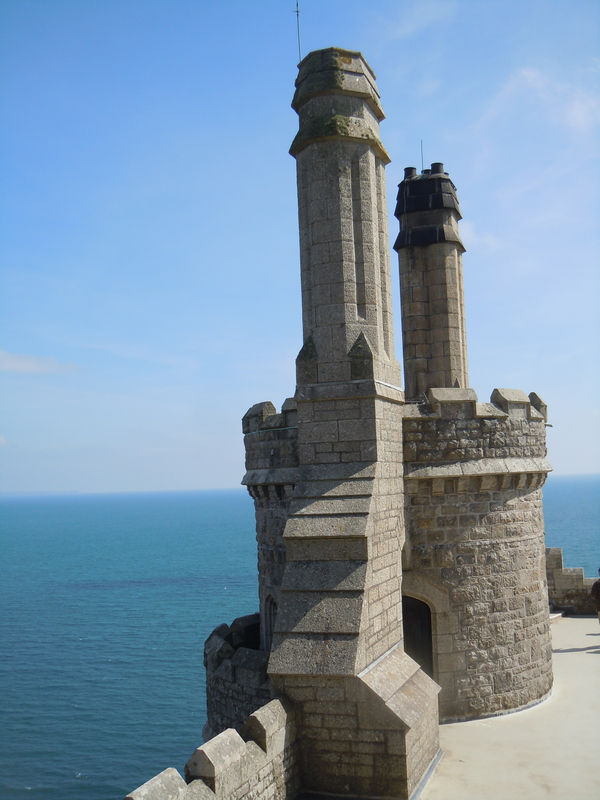 The castle is clearly visible walking across the Penzance harbor bridge on a sunny day, sitting atop its jagged slopes, catching the sunlight and beckoning you to climb its granite steps and walk among its ancient stones and tropical gardens. On a day when the sun has taken leave, out of the mist and barely visible, you might be drawn by the myths and legends that surround the island. Pulled by an image of the Archangel St Michael, who appeared to fishermen in 495, you might find yourself dreaming of an ancient stone chair that still stands at the entrance to the castle. Located on one of Britian’s most prominent ley lines, St Michael’s Mount is suffused in a spiritual energy both ancient and new. On a beautiful sunny day, Mark and I set out to explore this historic and most magnificent of places. The Mount is open to the public and you can cross the bay by boat during high tide, or wait until the tide is low and walk in the footsteps of time across the cobblestone causeway. 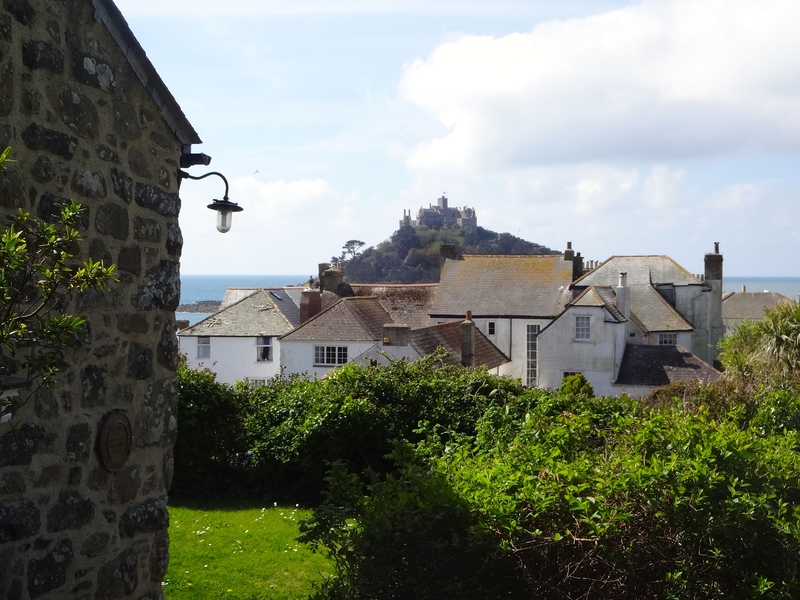 Mark and I choose to do the latter, and so we spend a memorable morning exploring the lovely town of Marazion, on the Cornish coast overlooking the island. 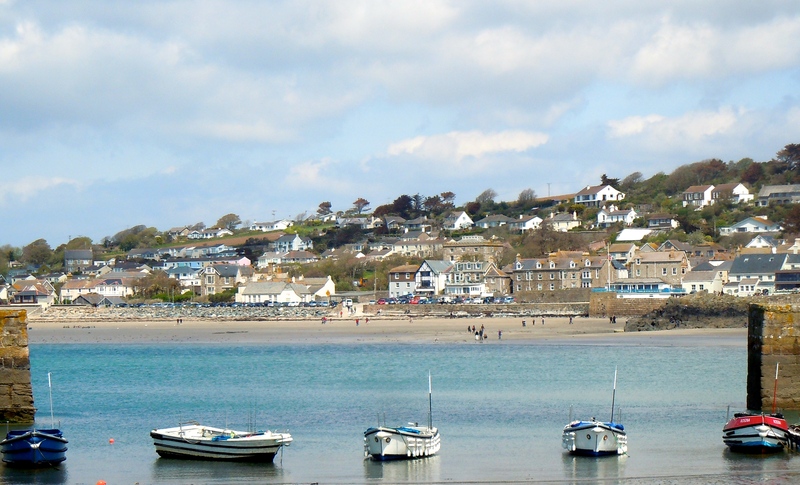 On a hill overlooking the bay and St Michael’s Mount is the village of Marazion, Cornwall’s oldest chartered town. 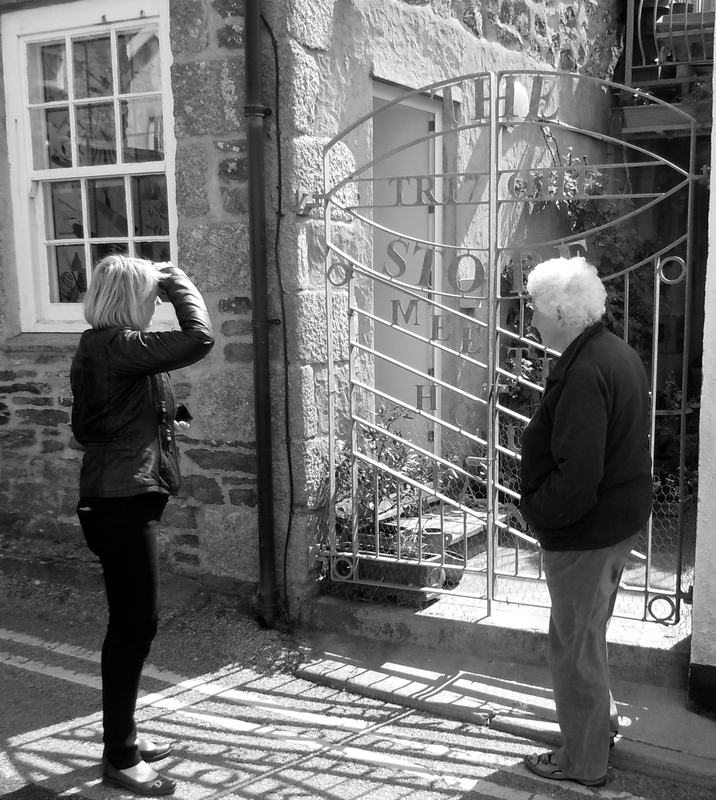 With a small town centre and winding streets sheltered by pristine cottages and row houses, Mark and I walk up and around to take in the history and architecture of this beautiful coastal village. As we round a bend in the road, snapping photos of everything imaginable, we garner a smile from a pleasant villager crossing our path. She seems surprised by us and when I point to my camera and comment that everything here is so beautiful, she responds with a simple, “I live here.” I continue my chatter about the history and architecture and she points us to the top of the hill where we will find the oldest public building, the Friends Meeting House, and the beautiful Memorial Gardens. As we turn to walk up the hill, our villager calls out and asks if we’d like to see her house. She clearly thinks we’re trustworthy and from our conversation of historic buildings has decided to show us her own home. We enter through a carved iron gate to a garden area. Our lovely hostess has traced the house, and its use, as far back as 1770. It was originally used as a tool shop and subsequently used by the current owner as she created costumes and stage sets for the theatre. The shop was then turned into a home, with the first level still used as a studio. The creative touches of our hostess are seen throughout the two floors of living space and the deck off the second floor. 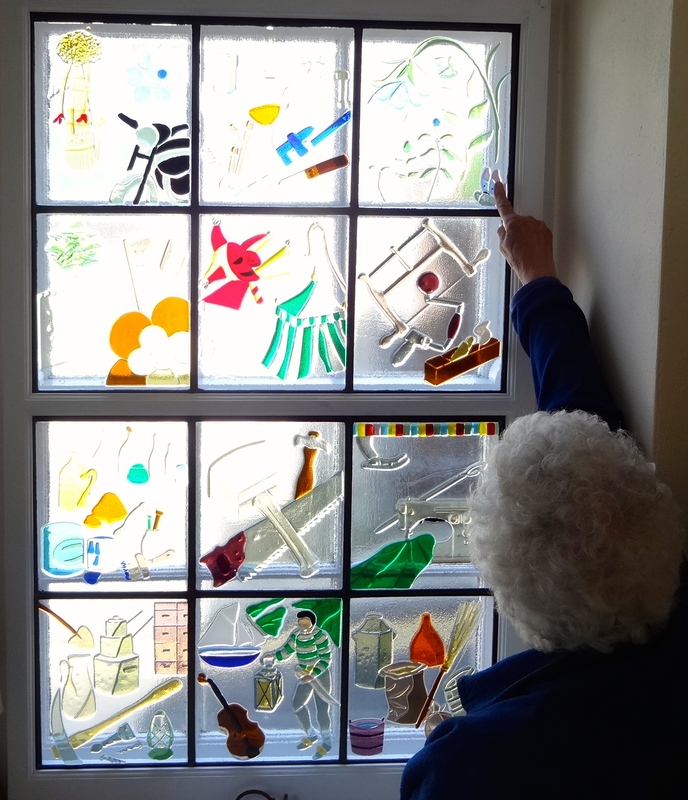 Two stain glass windows depict the life of the house and the life of our hostess. These are now part of the building and will remain into the future as historical reference. We leave her planting flowers in boxes along the tiny road and walk to the town centre to check out some shops, including The Summerhouse Gallery where I discover the beautiful and vibrant gold-flecked paintings by local artist Kate Richardson. We then head to the beach to see how far the tide has gone out. 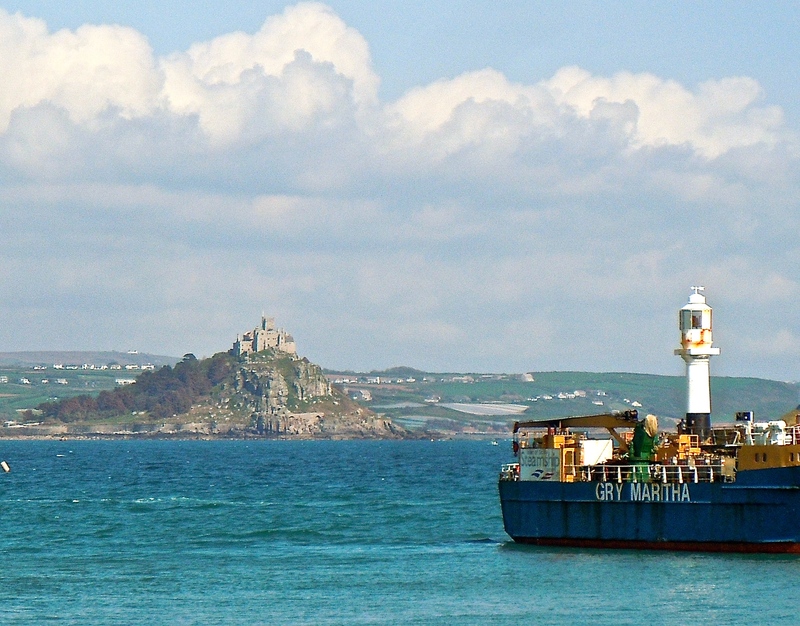 As the waters of Mounts Bay part, each end of the causeway becomes more and more visible. 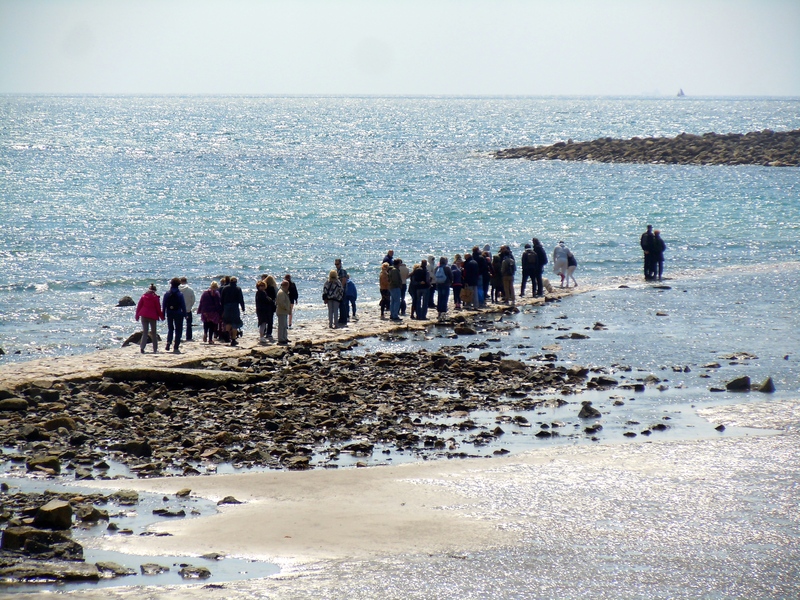 People gather on both sides stepping farther and farther into the sea as the waters recede. We walk across the rocky beach and climb onto an outcrop overlooking the causeway to wait a bit longer for it to clear. The process is gradual and since my cousins will be arriving in the afternoon and I need to get back, we decide to see how deep the waters are along the walk. 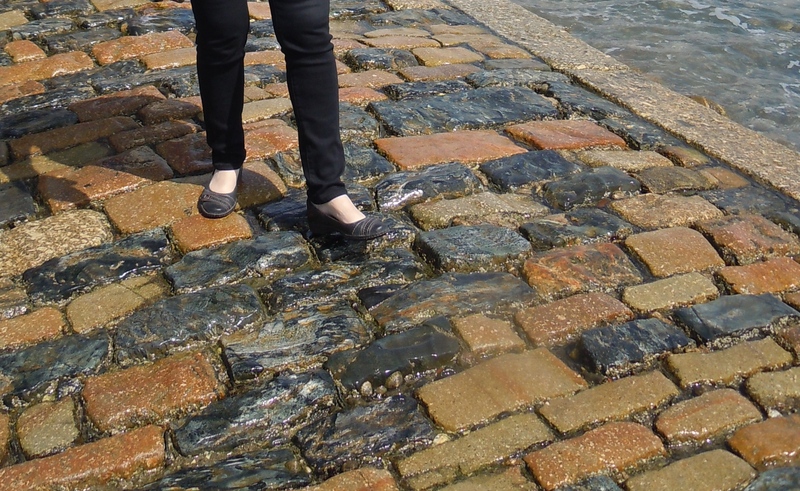 Mark springs across the cobblestones as waves rush over the top. I take off my shoes and follow. The water is warmer than expected; the stones cool on my bare feet. I walk cautiously as the path is uneven. I feel the sun on my face, the salt water rushing across my feet and the tug of history pulling me onward toward St Michael’s Mount. The castle that sits atop the granite outcropping that is St Michael’s Mount was originally a monastery, tied to the Benedictine Abbey of Mont St Michel in France, following the Norman invasion. 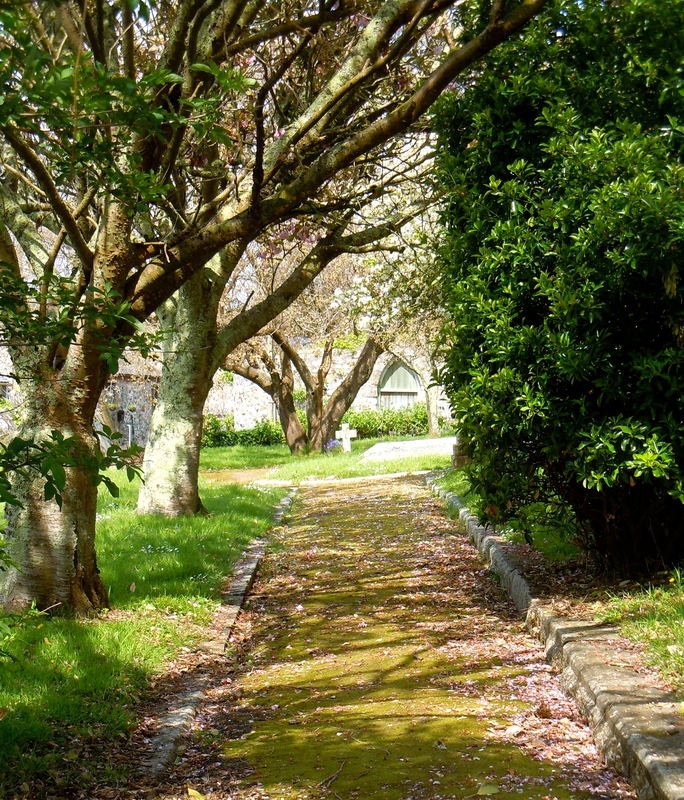 Since the 1650s, it has been home to the St Aubyn family, with James and Mary St Levan making their home here. 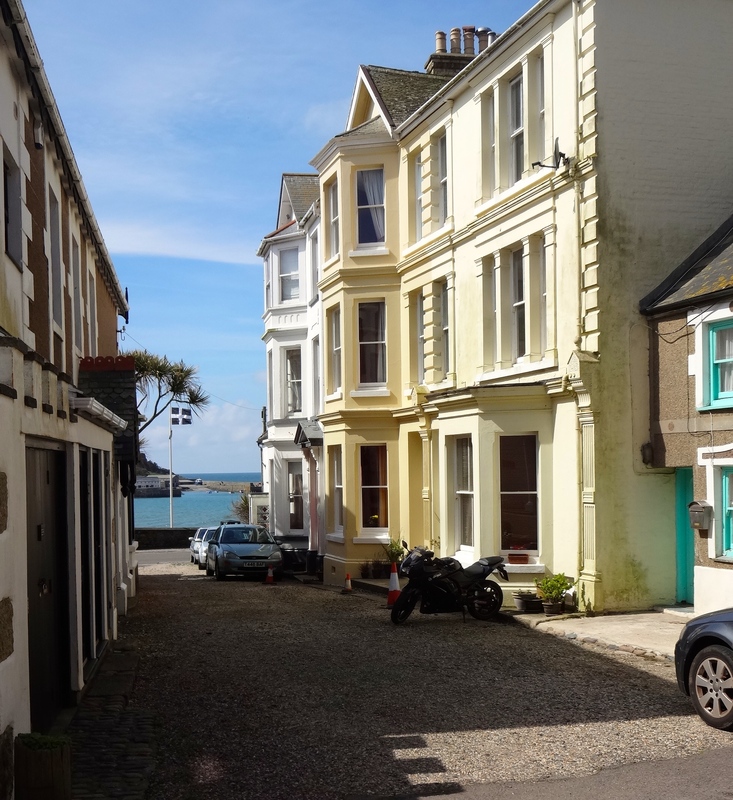 James is the 12th generation of the St Aubyn family, and while they reside in the fortress, many other families live and work on the island, occupying the waterside cottages at the foot of the Mount. 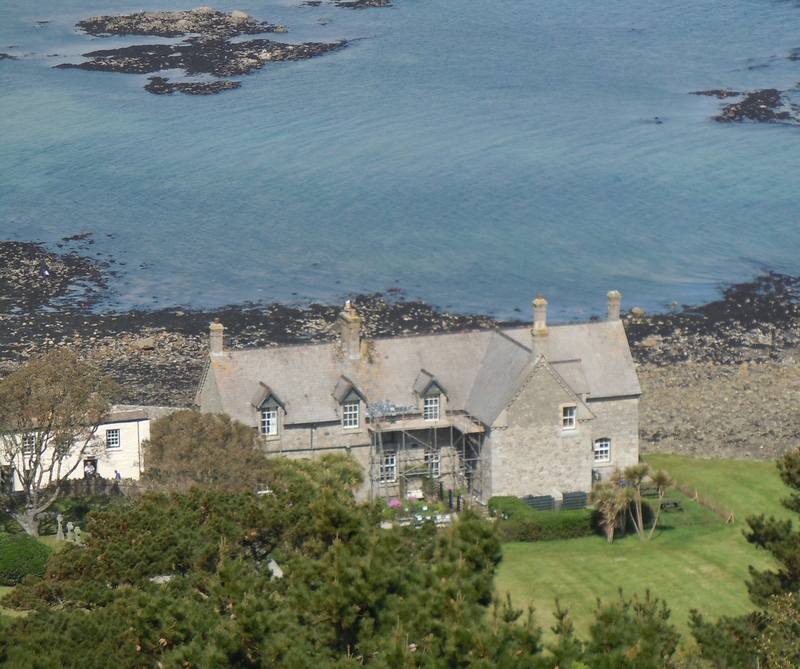 In 1954, James’s great-grandfather gifted the island to The National Trust with a large endowment fund and a 999-year lease for the St Aubyn family to continue in residence. The property is entrusted to James and Mary who live within its medieval walls, hosting events and keeping its history alive. After lunch at one of the island cafe’s, we take a walk around where the views out to sea are spectacular. 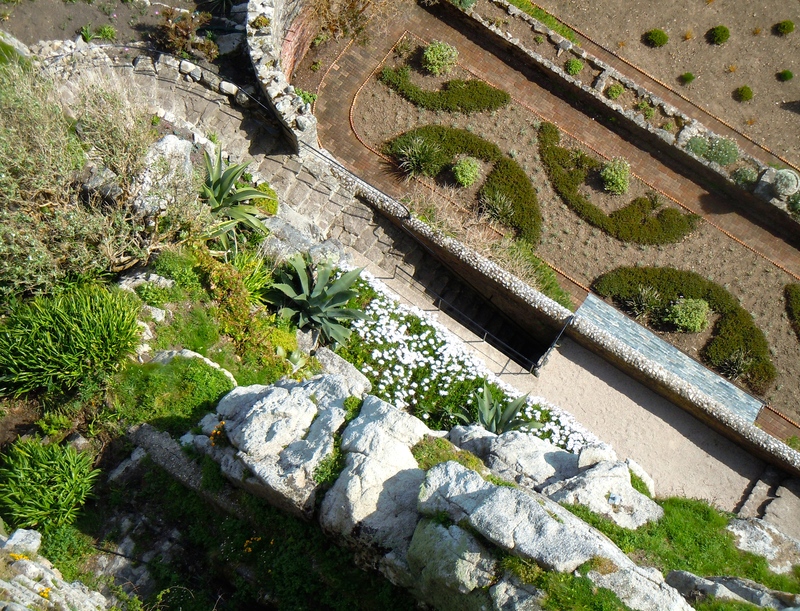 The walkway up to the castle is steep and uneven, but once you arrive at the castle door, it’s a world unto itself. Historic artifacts within its walls have been well maintained and there are many items dating to the 15th Century, including the beautiful stain glass St Michael rose window in the Priory Church. Items found on the island are also on display from the Bronze Age. The plaster work in some of the rooms is remarkable; some with intricate carvings and others depicting hunting scenes. Through the windows looking out to sea, it’s easy to get lost in thought and wonder at the lives of those who have walked these hallways before. Outside, the sub-tropical garden, with its variety of exotic plants growing out of cracks and crevices and clinging to the granite hillside, is serene and magnificent. Flowers delicate in their beauty, yet sturdy enough to withstand the wind and weather of this island, flourish. 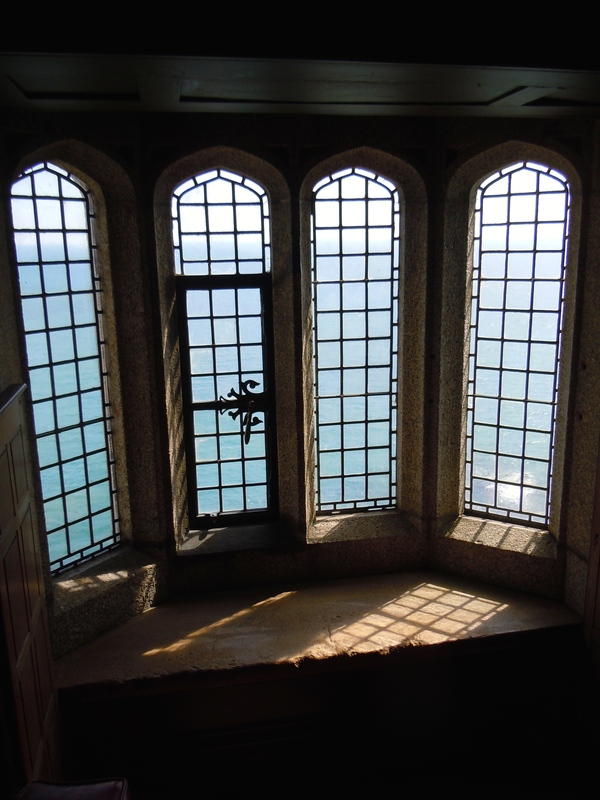 St Michael’s Mount is truly remarkable, filled with serenity and hope. For centuries, standing guard and looking out to sea, it whispers of magic and myth, of knights and kings, and of time—moving in a wave from past to present and on into the future. 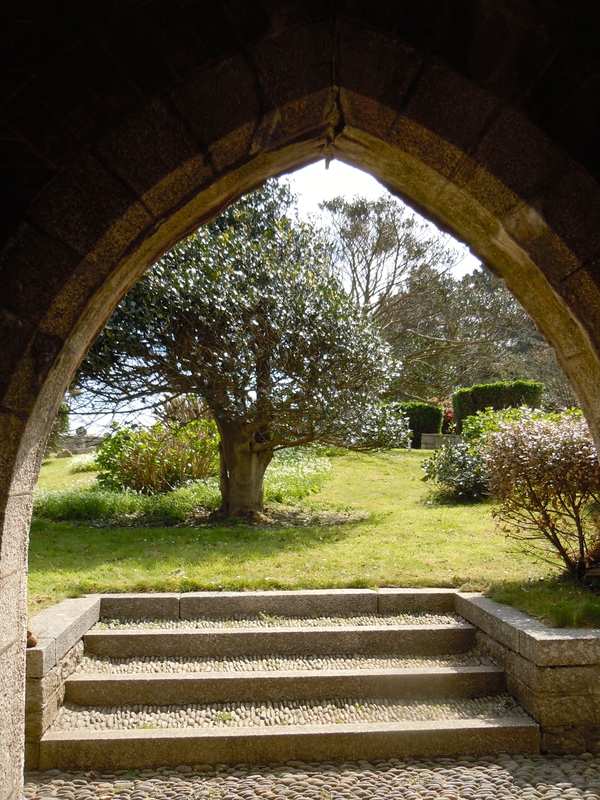 This entry was posted in Cornwall, England, Travel and tagged Art, Art Galleries, Artists, Benedictine Abbey of Mont St Michel, History, James St Levan, Kate Richardson, ley lines, Marazion, Myths and Legends, St Aubyn family, St Michael's Mount, The National Trust, The Summerhouse Gallery.